Containing a perfect blend of powerful antioxidants and essential nutrients, cabbage (Brassica oleracea capitata) is one of the healthiest foods in the world. Believe it or not, this common garden vegetable was found to lower blood cholesterol levels, detoxify the body and protect against Helicobacter pylori infection. Moreover, its naturally occurring sulfur compounds make it a powerful anticancer food, with the potential to reduce the risk of various types of cancer. 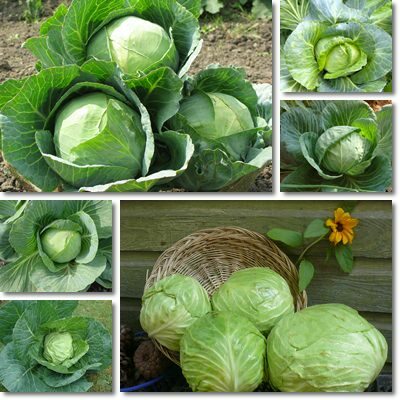 Eating cabbage provides important amounts of vitamins C and K as well as folic acid for pregnant women. According to the medical community, the regular consumption of cabbage constitutes the best prevention method against several cancers such as breast, ovarian, colon, bladder and prostate cancer due to the vegetable having high levels of antioxidant as well as anti-inflammatory compounds. With a good fiber content and special compounds that promote natural fermentation processes, the vegetable supports healthy gut flora populations. Including cabbage in your diet constitutes an important step towards overall good health and good nutrition. Everyone knows what cabbage looks like: a great, big, green and white ball (or head) of tightly wrapped leaves. There are, of course, variations in terms of color as well as leaf appearance such as red cabbage or spring greens, a type of cabbage with loose leaves. What does cabbage taste like? As you may already know, cabbage has a sweet taste both raw and cooked, with the mention that cabbage spines (the central part of the vegetable) may taste somewhat peppery. The leaves are quite tender and crunchy, breaking easily unless cooked, when they become soft and even mushy (if cooked for too long). 1) White cabbage or Dutch cabbage, with light green leaves with patches of white. 2) Green cabbage, with dark green leaves. 3) Red or purple cabbage (Brassica oleracea capitata rubra), with red-purple leaves. 4) Savoy (Brassica oleracea sabauda), with ruffled, dark green leaves. A good reminder when it comes to cooking cabbage is to cook it as little as possible in order for it to lose as little nutrients as possible. Of course, you may encounter reluctance from your children’s part when it comes to eating veggies. So I am going to tell you how my mother convinced my highly reluctant brother to eat cabbage: she made it into salad. A delicious raw cabbage, raw carrot and chopped dill salad with a vegetable oil and vinegar dressing. As delicious as it may be to stuff boiled cabbage leaves with meat, rice and spices, then simmer in water and fat for several hours, I recommend you try this cabbage salad recipe: wash your cabbage well, grate it in a large bowl, add two or three tablespoons of vegetable oil (sunflower oil, olive oil), one tablespoon vinegar (optional, because it’s not good for anyone with gastritis or ulcer), two or three grated orange carrots, a pinch of salt and lots of finely chopped, fresh dill. It will speak for itself. 1) Exceptional anticancer food. Cabbage contains 45 different flavonoids, notably quercetin and kaempferol as well as outstanding amounts of vitamins A, C and K, all powerful antioxidant, anti-inflammatory and antitumor agents. All of these antioxidants clean our body of free radicals, dangerous reactive oxygen molecules which damage cells causing them to mutate and increase inflammation levels, two known factors which favor cancer debut. By adding up the individual activity of each of these antioxidants in cabbage, it has been concluded that regular consumption of the vegetable actively prevents bladder, breast, ovarian, prostate and colon cancer as well as endometrial, stomach and lung cancer. 2) Detoxifies the body. Cabbage boasts an excellent nutritional profile. It is rich in vitamins, minerals, a good source of fiber (2 g/100 g) and has no cholesterol and no unhealthy saturated fatty acids. Regular consumption promotes toxin elimination and, at the same time, helps strengthen the body due to its high vitamin and mineral content. 3) Protects against Helicobacter pylori, gastritis and ulcer. According to preliminary research, kaempferol and glucosinolates, natural compounds found in cruciferous vegetables such as cabbage, broccoli and mustard, have proven an efficient treatment against the gastritis and ulcer-causing stomach bacterium Helicobacter pylori. Glucosinolates are released when crushing, chopping or chewing on raw cabbage leaves. 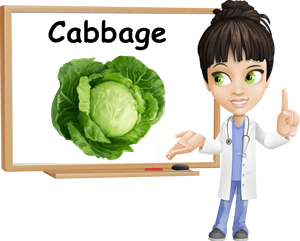 Raw cabbage juice is a traditional remedy for treating ulcer. However, if you already suffer from gastritis, acid reflux or stomach ulcers, eating cabbage, either raw or cooked, might upset your stomach even more, so it’s best you avoid it. 4) Amazing vitamin content. Cabbage provides good amounts of vitamins C and K and trace amounts of vitamin A, all potent anti-inflammatory and antioxidant agents. Vitamin K also supports blood coagulation processes and calcium absorption in bones, reduces atherosclerosis risks and inflammation marker levels. Vitamin A is one of several essential nutrients for good immunity because it protects the integrity of our mucous membranes in the nose, mouth, throat, stomach, the parts directly exposed to elements of the outside world and infectious agents. Vitamin C helps prevent cardiovascular disease, stimulates immunity, reduces inflammation and prevents wrinkles. 5) Good dietary fiber content. 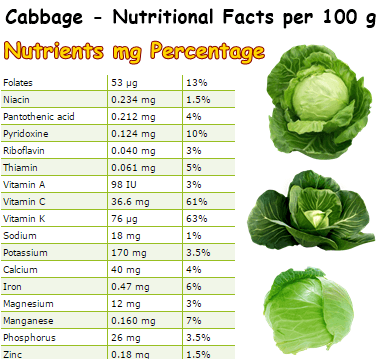 100 g of raw cabbage has 2.5 g of dietary fiber. A good intake of fiber from dietary sources helps improve transit time and relieve constipation, with benefits for hemorrhoids management (see what foods to eat and to avoid for hemorrhoids). Moreover, cabbage supports healthy gut flora populations via fermentation, further contributing to digestive health. 6) Other health benefits. Considering it is rich in quercetin, cabbage contributes to the treatment of bladder infections, prostate inflammation as well as high blood cholesterol levels, allergies, hypertension and atherosclerosis. The red-purple color of red cabbage indicates the presence of anthocyanins, another group of powerful antioxidants. Sour cabbage (Sauerkraut) is a traditional hangover treatment. Last but not least, cabbage is a good source of essential minerals such as calcium, copper, iron, magnesium, manganese and phosphorus which contribute to good overall health. The truth is you will never see cabbage being praised on television for its extraordinary antioxidant, anti-inflammatory and anticancer properties or for its good nutritional profile. I mean, it’s cabbage. It will give you gas. They’d rather tell you about how you must have that one extract of some pricey, exotic fruit you can barely get your hands on. Conclusion. It’s just like with medication: instead of paying less for the same active ingredient, you pay more for the brand giving you the exact same active ingredient, just in a prettier bottle, under a different name. I say why not eat cabbage if it’s extremely healthy, cheap and easily available? Find a cabbage recipe you enjoy and include this healthy vegetable in your diet too enjoy all of its wonderful health benefits.